President Donald Trump is scrambling to find a new chief after his first choice to replace John Kelly bailed at the last minute and several other potential successors signaled they weren’t interested. The list of candidates is said to include Office of Management and Budget Director Mick Mulvaney; Rep. Mark Meadows, R-N.C., the chairman of the conservative House Freedom Caucus; and former New Jersey Gov. Chris Christie. Trump on Tuesday disputed news reports that he’s having a difficult time finding someone to take the position. White House counselor Kellyanne Conway said Tuesday that Kelly would be staying on “at least” through Jan. 2. “There are people vying for it. There are people under consideration. And it’s a personal decision for the president,” she told reporters. “It’s not been anything that I’ve been out advocating for,” Meadows said in an appearance on Fox News, but he added that “my life changed” after Trump’s top pick, Nick Ayers, Vice President Mike Pence’s chief of staff, decided to pull out of the job. Indeed, even senior White House aides were stunned by Ayers’ decision, leaving Trump, who had no backups lined up, scrambling to find a replacement. Trump is now soliciting input on a long list of candidates and allies are pitching even more contenders, including former Trump deputy campaign manager David Bossie, acting Attorney General Matthew Whitaker — even White House communications director Bill Shine and press secretary Sarah Huckabee Sanders. Many weren’t being taken seriously, but the breadth of the list highlighted the uncertainty in Trump’s political orbit over the job hunt. Bossie, in an interview Tuesday with Fox News, did not deny interest in the job but said he didn’t “foresee” Trump offering him the position. As quickly as names were being floated, though, some candidates appeared to be pulling themselves from consideration, underscoring the challenges of working for a mercurial president who has acknowledged that he likes to surround himself with chaos and despises any suggestion he’s being managed. Trump’s administration has set records for staff turnover, and the president has often struggled to attract experienced political professionals, a challenge that has grown more difficult with the upcoming threat of costly Democratic oversight investigations and an uncertain political environment. U.S. Trade Representative Robert Lighthizer, a potential contender, said he was “entirely focused” on his current position. A person familiar with Treasury Secretary Steven Mnuchin’s thinking but not authorized to speak publicly made clear he, too, is happy in his current post. Former RNC Chairman Reince Priebus’s departure from the White House was unceremoniously announced by tweet. 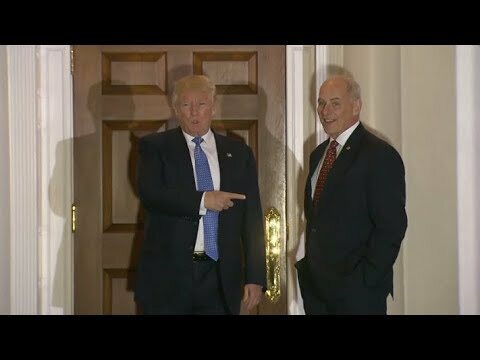 Nearly 18 months later, Trump stepped on an orderly succession plan for Kelly, making a surprise Saturday announcement on the White House lawn that the retired general would be leaving by year’s end. Trump and Ayers had discussed the job for months, and the president had already been steering inquiries to him rather than Kelly. These people, like others, spoke on the condition of anonymity because they weren’t authorized to speak publicly. While a White House official said Ayers’ decision was driven by a desire to return to Georgia to be closer to his family, people familiar with his thinking said he was also worried about scrutiny of his former political consulting business. He and Trump also could not agree on Ayers’ length of service. Ayers wanted to serve on an interim basis; Trump wanted a two-year commitment. Trump was stung by Ayers’ decision to back out, according to people close to him. The embarrassment comes at a pivotal time for Trump, as he prepares for re-election while facing an expected onslaught of investigations from Democrats who will take control of the House and amid the ongoing Russia probe. With Ayers no longer waiting in the wings, there is fear that Trump may not have someone in place in time for Kelly’s departure or that he will pick the first person who comes to mind as he tries to counter perceptions that no one wants the position. Trump has told confidants that he wants his third chief of staff to be someone he can chat with — trading gossip and complaining about media coverage — as well as someone more attuned politically.